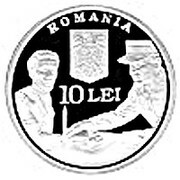 An image depicting Lieutenant Aviator Dr. Victor Anastasiu, founder of the Aeronautical Medical Centre, measuring the arterial blood pressure of a candidate to the pilot school; above, from the upper part to the lower part, the inscription “ROMANIA” in an arc, the coat of arms of Romania and the face value “10 LEI”. The coat of arms of the National Institute for Aeronautics and Space Medicine surrounded by the three-row semicircular inscription “INSTITUTUL NATIONAL DE MEDICINA AERONAUTICA SI SPATIALA GL. 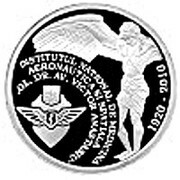 DR. AV. VICTOR ANASTASIU”, a depiction of the mythological hero Icarus and the inscription “1920-2010” in an arc.